WASHINGTON—Senate Foreign Relations Committee Ranking Democrat Bob Menendez (D-NJ) grilled U.S. Ambassador-designate to Azerbaijan Earle Litzenberger on Thursday about President Aliyev’s “bellicose rhetoric and sporadic outbursts of violence,” securing from the nominee a commitment that he would urge the Azerbaijani government to step back from any threatening behavior that disrupts the line of contact, reported the Armenian National Committee of America. “If confirmed, what steps will you take to urge the Azerbaijani government to step back from its threatening behavior and permit necessary monitoring along the line of contact,” asked Senator Menendez during a Senate Foreign Relations Committee nomination hearing. Asked by Senator Menendez whether U.S. security assistance to Azerbaijan should be curtailed based on human rights abuses, Litzenberger responded that the State Department will be “very careful to ensure that nothing that we do or provide [in terms of U.S. security assistance] to Azerbaijan undermines the effort to reach a peaceful settlement of the Nagorno Karabakh conflict.” He went on to note that U.S. security assistance to Azerbaijan will continue to include training in human rights, a point of heightened concern since the Safarov scandal. “We want to thank Senator Menendez for securing a commitment from the State Department that our next U.S. 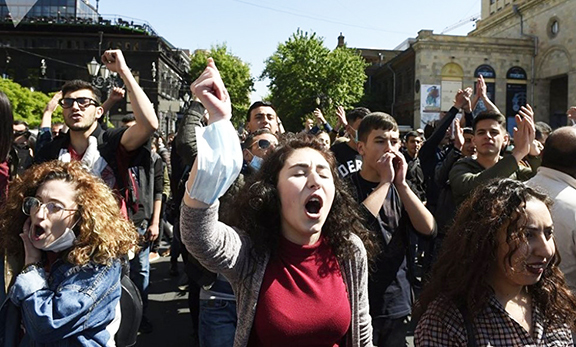 Ambassador to Azerbaijan will press the Aliyev regime to step back from its threatening and violent conduct,” said ANCA Executive Director Aram Hamparian. “Along with our Hellenic allies, we were grateful for the Senator’s aggressive line of questioning on Cyprus, which revealed just how very afraid U.S. leaders remain of crossing Ankara’s red lines against any honest discourse on its occupation of Cyprus and obstruction of justice for the Armenian Genocide,” noted Hamparian. When Mr. Litzenberger’s nomination was announced in early September, the ANCA encouraged Armenian Americans, friends of Armenia, human rights activists, and advocates for peace to call on their U.S. Senators to carefully scrutinize President Trump’s nominee. Thousands took action through the ANCA’s “March to Justice” action portal – anca.org/azerbaijan. Senators have 2 days to submit written questions to the various ambassadorial nominees. In the upcoming weeks, the Senate Foreign Relations Committee will have the opportunity to vote on the various ambassadorial candidates, after which the full Senate will review the matter.